On a cold rainy day, over cast with droplets misting the windshield so slowly that the interval setting was used for the wipers, we sought a famous winery down a side street in Beullton. We pulled up in front of it 5 minutes after it was due to open only to find its doors locked. We knocked, looked in the windows….no-one was there. Disappointed, we wondered around the other store fronts - antiques and such - a simple warehouse strip mall type area. Few were open. Then, with a glance across the way, a door was open. “I got something!” and ran over…. Walking in, the room presented itself with confidence! Barrels reached half way to the ceiling, a warm wooded bar greeted at the entrance. A humming noise emanated from the barrel room and with a brief walk into the large expanse, a press was gently extracting juice from grapes…a glass of milky red hue sat on the machine while a tube transferred raw juice. In a small nook near a tower of barrels was an elevated stage with drums and speakers. The echo said no…with more silence. It was like being a fly on the wall: watching a room during harvest season. Where was everyone? Wondering around, the room was raw and natural; the real deal - not just a tasting room: a working room making wine. A door from behind a wall made a noise. The sound of footsteps followed. From around a corner a middle aged gentleman appeared and walked behind the bar. 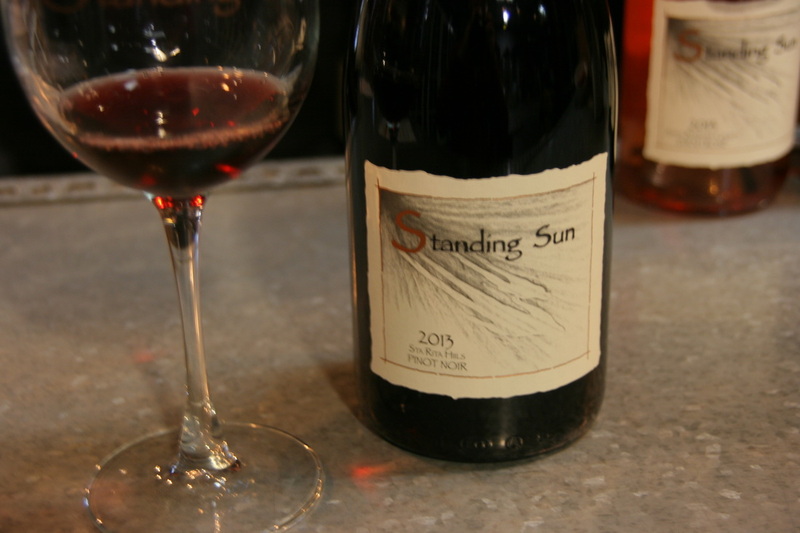 Introductions were made, a tasting proffered, and the story of Standing Sun unfolded. 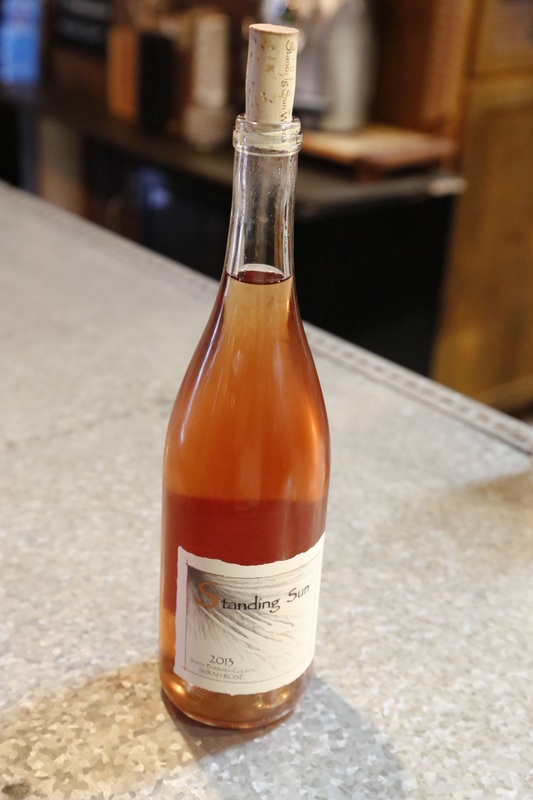 I sipped the saignée method rosé – beautiful! I generally don’t like rosés because of the tartness ever so common in them but that did not exist in his wine. A single vineyard Syrah from the famed Camp 4 vineyard (previously of Fess Parker before being returned to the Chumash Indians in his will) it is very light, fruity and very accommodating! Very well balanced acidity carries darker blackberry fruits and hints of spices. Light and fresh, this is a very unique wine. I glanced around the room and asked about the music stage. “Every Friday and/or Saturday night my band performs or we host a band and in warm weather we’ll sometimes have a BBQ out front or invite a food truck – it’s just a great way to live life!” He says with a natural, matter of fact smile while pouring Le Blanc. The Le Blanc is a southern rhone blend and is a rich, shining, standing ovation to the way the varietals come together. Consisting of 40% Grenache Blanc, 30% Viognier, and 30% Roussanne, it shows great clarity, richness, and depth in the glass with a youthful pear hue. On the nose, exotic flowers and fruits commingle together evoking vanilla bean, lemons, and apricots. On the palate, a surprising complexity of flavors abound. For a wine consisting of 40% Grenache Blanc, it is surprising rich with fresh balanced acidity and a silky smooth texture. Clean, crisp, and lively lemons a right up front followed by steely minerals in the mid-palate and finishing with peach and orange peel. I also asked about the art on the walls. He pours a taste of his Riesling. I try it. I am immediately impressed with the quality of the wine, its structure, and craftsmanship. It almost reminds me of a Gruner-Veltniner due to its crisp cleanliness but this is clearly a Riesling! Unctuous, clean yet round with exotic fruits of mango and pineapple…but not their astringent acidity - the acidity is there but very balanced in the natural sweetness of the fruit and yet this is not a sweet Riesling, it is dry and balanced. With the nature of the setting in a warehouse and the lifestyle he lives, I asked him how he came to this life. He poured the Pinot Noir. The aroma wafted all around the counter! Deep, dark cherries and black berries filled the air. I took a deep sniff and was inundated with bright fruits balanced with a solid earthy minerality. With the first sip, the depth and complexity was solidly noticed. Hints of oak create a very structured yet supple foundation with layers of dark berries and earth. Strong and drinking very nicely immediately, it has the depth and structure to age a few years as well. I take a sip and it tastes like almost an overly sweet fruit juice. We discuss other technical areas of wine production and I felt a deep appreciation for the work and wine he was doing. This is the best part of wine tasting at wineries: developing that new emotional connection with the wine and those who make it. We bought several bottles and knew we’d reminisce about this visit at Christmas or whatever special occasion when we would open them.